ILD leaflet announcing demonstration, parade, and rally in Chicago for the Scottsboro Boys. You are here: Home » Media » Images » ILD leaflet announcing demonstration, parade, and rally in Chicago for the Scottsboro Boys. 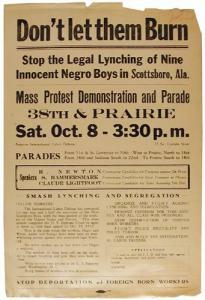 Item Title ILD leaflet announcing demonstration, parade, and rally in Chicago for the Scottsboro Boys.